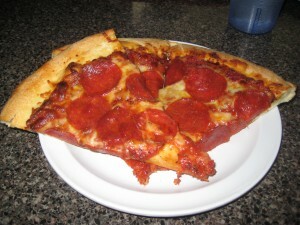 One day I was reading about Stuft Pizza and saw somewhere that they had dollar slices on Mondays. Figuring that was a pretty awesome deal, I called them up to see if the dollar slices still existed. When I got a quick confirmation on the phone, I headed over for a cheap lunch. At first, I was disappointed because the pizza rotating in the little pizza by the slice heater wasn’t even stuffed. Instead it looked like any other pizza and begged the question of how the place got its name. Nonetheless, I was already there and determined to eat pizza, so I ordered three slices of pepperoni and waited for the man behind the counter to ask me for three bucks. This sound never came, as the man asked me for a total that far exceeded three bucks. “I thought Monday was dollar slices?” I asked. Dammit. I thought about leaving again, but at this point I was just hungry and hoped that the pizza would at least be filling enough to merit the name “Stuft Pizza.” It wasn’t. In fact it was pretty disappointing. This is not to say that it was bad pizza, because let’s be honest here, it’s tough to make a bad pizza. It was just a disappointing experience that left me hungry for a different pizza place.